If you recall, Clarett was arrested for armed robbery on January 1, 2006 outside of a danceclub in Columbus. He robbed two people and took a cell phone worth $150. He had a loaded .45 handgun. Later that year, in August...he made an illegal u-turn and led Columbus police on a chase that ended in him driving over a spike strip and stopping in a parking lot. Upon his arrest, in which he spit on police calling them racially charged slurs, the contents of his uncle's SUV were revealed. 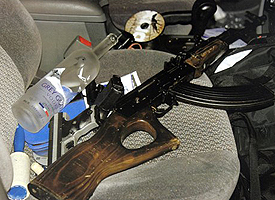 A loaded AK-47 assault rifle, two loaded hand guns, a katana (long Japanese sword) and an open bottle of Grey Goose vodka. Handguns...check. AK...check. Grey Goose...check. Lint roller...check. LETS ROLL! After pleading guilty to all charges, he was convicted to 3 1/2 years in jail. 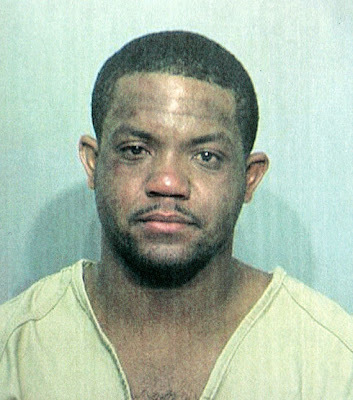 After finishing his stint in the clink in Toledo, he was released to a halfway house in Columbus where he resides now. All I can say is that if it weren't for rules that say a player can no longer play college football once they've played in the NFL, I'd be willing to bet he'd be interested in playing for Tressel again. And I'd also be willing to bet that Tressel would consider it. I don't wish Clarett ill-will. And I do hope that he's a reformed citizen. But putting him back in the same place where he fell into all this trouble is probably not the best course of action. But hey, if he's reformed enough for the state of Ohio, then he's clearly met all the requirements for THE Ohio State University. LMAO, that last line is absolutely hilarious.